MMA Champion-turned-actress Gina Carano is already a familiar face to film fans for her breakout leading role as Mallory Kane in Steven Soderbergh’s recent actioner, Haywire, and for her blockbuster turn as DSS Agent Riley Hicks in Justin Lin’s Furious 6. Soon, Carano will be back on the big screen for her third feature film, In the Blood, directed by John Stockwell (Blue Crush, Turistas). In the Blood finds Carano starring as Ava, a woman off on a Caribbean honeymoon with her new husband (Cam Gigandet). When he goes missing, it’s up to Ava to solve the mystery and to get him back by any means necessary. Also starring are Danny Trejo, Stephen Lang and Luis Guzman. ComingSoon.net spoke with Carano about bringing together action and acting for her third feature film, which should be on the way to theaters soon. In the below conversation, she discusses In the Blood‘s fast-paced Puerto Rican production, expanding her range as an actress and where she’d like to see her career go in the future (which, she says, has her reading a lot of comic books these days). You can also check out a larger version of the above still, the first released from In the Blood, by clicking here. CS: How did “In the Blood” begin for you? 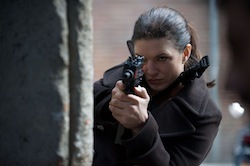 Gina Carano: It just came! I got it a long time ago. I remember reading the script for it and I called my agent and was like, “Look, I really like this script.” I kind of connected with it immediately. Sometimes I’ll get scripts and they’re hard to get through or I don’t really connect with it. This is one script, though, that I just really connected with and really wanted to do. I called my agent and was like, “I want to make this happen.” I had been in London shooting “Fast & Furious.” Two days after I got done shooting, I went straight to Puerto Rico and was wearing a wedding dress, filming there. CS: It seems like such a quick transition you’ve made from being an MMA fighter to being an actress. What’s the long-range career plan on your part? Carano: It’s kind of interesting. You have your first couple of films and you don’t know exactly what you’re doing. You’re kind of going off of everybody else. Thank God I was surrounded by so many great people on “Haywire.” It was such a great first experience with “Haywire” and then I got to continue that experience with “Fast & the Furious 6.” It was a completely different group of people, but they were all wonderful. I started really enjoying getting into the acting part of it. Displaying your emotions on film as well as being physical. I think it’s really in “In the Blood” that I really got the bug. It’s one of the best feelings in the world being able to successfully get your emotions across. CS: What would you say is the biggest thing that has surprised you about acting as a career? Carano: Cinematographers can see everything. They look through that little lens and everything is just right there. They can see all your faults and you have to come across as genuine. I think that really understanding your character and being able to make that a believable thing is something pretty special. I think that actors work their whole lives to get the opportunities that I’ve gotten. For me to play catch-up in that short a time was not as easy as it looks. You have to really search your soul and ask what these people would really be thinking and hoping. I’m surprised of the adrenaline I can get just off feeling different emotions. Then, making fight scenes look real is just a whole other art. I kind of fell in love with the art of it, I think. CS: You’re obviously incredibly talented at handling yourself in a very physical fight scene, of which “In the Blood” has quite a few, but there are also some very physical scenes that aren’t necessarily fighting. There are some sequences on a zipline, for example. Is that a very different skill set or is it an expansion of fighting skills? Carano: Oh my God. That was awesome. “In the Blood” is one of the craziest things I’ve ever done and it was such a quick shoot at the same time. I would wake up every day not even knowing what they had in mind for me. It was just so intense. Every single day was something different. I’d come to set and wouldn’t have much prep time because I was filming “Fast & Furious.” I would show up and we’d do a fight scene and we’d make up on the stop, on the day, the fights. I’d say, “Okay, I like what the stunt coordinator has here, but I’d like to add this on top of that.” I was very active trying to find a way to both build the character and make use of my skill set. That was good for me because I got to actually create. It was so much fun and it was such a quick shoot. I love creating. This was a smaller film compared to the other films I’ve done, but it’s also one of my favorites because I just got to sit there and create. It makes working those long hours so worth it. You get to be so much a part of it, creatively. CS: Are these the kind of movies that are your favorite? Are you first and foremost an action fan? Carano: I am! I love it. But I’m a big fan of all types of movies. One of my favorite moments in “In the Blood” was figuring out how to be emotional and having that comes across a couple of times in that film. You saw it, right? I had a crying scene! That’s honestly one of my proudest moments that I’ve ever had, walking away and knowing that I can actually get that across and have people see me like that for a second. I used things that have happened in my past and used them in support of the character. It was one of the most therapeutic things I’ve ever done. CS: The film has such beautiful, tropical locations and yet what your character is going through is so unpleasant and brutal. How does that affect your headspace? Carano: Puerto Rico is such an amazing place and I got to see some of the most interesting parts of Puerto Rico. John Stockwell is just a madman and I absolutely loved working with him and all the actors. At one point, you look at the cast and crew and realize that you’re all in this together. You’re all making the same film. When you’re actually filming, though, it’s a lot harder to enjoy the scenery. You actually feel like you’re that character and that kind of situation. I’m about to go back to Puerto Rico and enjoy it in a different way because it was a pretty, pretty shoot. CS: I’m curious as to what kind of bond you formed with John. It seems like a lead and their director really have to trust one another on a fast-paced production like this. CS: You also have a bunch of great scenes with Luis Guzman, who plays a local police officer. CS: Has there been any discussion about coming back for the next “Fast & the Furious”? Carano: Well, they killed me off! CS: So? Sung Kang died in the third film. That has not stopped the franchise in the past. Carano: (laughs) That’s what everyone is saying! But, no, I don’t think so. I’m taking incoming calls on some stuff. Whatever I do, as far as work and my own life, I just want to stay passionate about it. As long as I can artistically express myself and keep on this path of supporting myself, I’m going to be a happy woman. CS: So what’s a dream project for you? Carano: I’m starting to get into the comic book space a little, which I think is just so absolutely fun. Just to dress up. I can’t really talk about it right now, but there’s some really good prospects about what we might do there. I love playing dress-up. I love going on red carpets. It’s almost just like playing dress-up in your grandmother’s closet. I want to get some different looks and have some fun. As long as I connect to it, it can be anything from an emotional character to an action character to anything. I just want to let loose and have some fun a little bit. CS: Speaking of comic book movies, yours is a very popular name for potentially playing Wonder Woman, as I’m sure your aware. Carano: Which is such an incredible compliment. That’s the ultimate superhero for a woman. No matter what, no matter who ends up being Wonder Woman someday, I just hope it’s something that is done correctly. I know it’s there and that it could definitely be done correctly. It’s just a matter of getting the right people and having the right vision come together. A director and producer and writer have to see the beauty in it and make it real.